Facebook advertising has gone beyond simply running an ad in Facebook’s sidebar for any link you choose. If you want to make sure your brand, latest products, and current promotions receive the most exposure possible on Facebook, you might want to try out the new advertising options now available for Facebook pages. These options can help you increase visibility for your brand on Facebook, gain new likes, and get more exposure for your status updates. In this post, we’re going to learn how to use Promoted Posts and Sponsored Stories to achieve these goals. 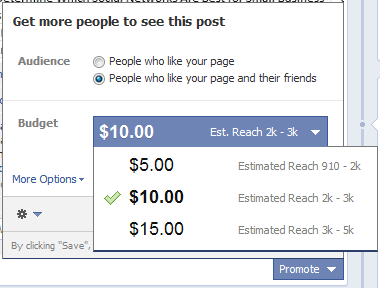 The newest and generally least expensive Facebook advertising option on Facebook is Promoted Posts. If your Facebook page has at least 400 likes, you can use Promoted Posts to ensure that more of your fans as well as their friends can see your individual status updates. Why You Need Promoted Posts? If people are fans of your page, why do you need to promote your posts for your fans to see them? It’s all thanks to Facebook EdgeRank. Facebook explains it as the way they determine what posts will be seen in the news feed based on how many friends are commenting on the piece, who posted it, and the type of post it is (photo, video, or text only status update). Other sources such as EdgeRank Checker and Econsultancy have posted their own views on how EdgeRank works, including how individuals won’t see posts from a page unless they have engaged with it. How many of your fans will see your posts when you just post them to your wall vs. when you promote them? Over the last few months, I have been measuring a page with around 1,000 likes and found the following. Wall posts without Promoted Posts advertising have received an average estimated reach of 50% of the current number of people who have liked the page. Wall posts with Promoted Posts advertising have received an estimated reach of 3,000 – 5,000 people including those who have liked the page and their friends. As you can see, Promoted Posts do not just help you reach your current fan base. It helps you reach beyond them. How to Use Promoted Posts Using Promoted Posts is easy. After you have posted a status update to your Facebook wall, simply look at the bottom of it. You should see a “Promote” link with a dropdown arrow next to it. Click on this to see the different levels of promotion you can do based on the estimated number of people you would like to reach along with the total budget for your promotion. 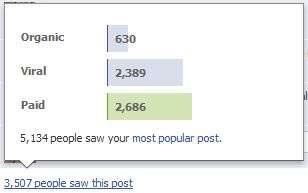 Your estimated reach will vary based on the number of likes your page currently has. If this is the first time you have used Facebook advertising, you will be directed to set up a method of payment. Otherwise, you can select your preferred method of payment and set your status update to be promoted. Promotion of your status update will happen for three days once your promotion has been approved by the Facebook advertising department. You can keep an eye on how your promotion is going by simply visiting your Facebook page and hovering over the link to number of people who saw the post beneath the status update. At the end of the promotion period, you will see the total budget that was used and number of views you received. You can compare your reach for your Promoted Posts vs. basic status updates within Facebook Insights and see additional demographic data using Customer Intelligence. Sponsored Stories, your next option for Facebook advertising, allows you to promote either your Facebook page or individual stories on your page’s wall. How Do Promoted Posts & Sponsored Stories Differ? Here are a few key differences between promoting individual stories on your Facebook page wall with Promoted Posts vs. Sponsored Stories. Promoted Posts is only available to pages with 400 or more likes. Sponsored Stories is available to any page with the goal of increasing likes to the page. Promoted Posts will only show wall posts to your fans and friends of fans. Sponsored Stories can be shown to anyone, regardless of whether they are fans of your page. Promoted Posts offers no targeting options. Sponsored Stories allow you to use advanced targeting options including basic demographics, interests, and more. Promoted Posts only help boost visibility for your wall posts. Sponsored Stories can be used to boost visibility to your page and your wall posts. How to Use Sponsored Stories to Increase Page Likes If your goal is to increase the number of likes to your page, you will have two options with Sponsored Stories. To begin, visit the Facebook Advertising page and click the green Create an Ad button. First, you will choose a Facebook destination or enter a URL. To create an ad for your page, simply choose your page from the dropdown under Pages and Places. Once you have selected your page, you will be given two options to promote your page or a specific post on your page. Select your page. 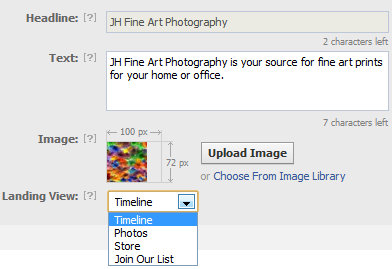 You will then get two options: to create a new ad or display stories about friends liking your page. A new ad lets you create a description and thumbnail for your page. You will also get to choose the Landing View from the custom tabs on your Facebook page. Choosing a Landing View other than your Timeline (wall) is a great way to promote custom tab content on your page including a welcome tab, mailing list signup, online store, or other content. For example, if you are running a sweepstakes campaign, you can customize your ad’s description to say what is being offered in the giveaway and change the Landing View to your sweepstakes tab. This way, people who see your ad will want to like your page and then click through to enter your sweepstakes. Alternatively, you can choose the option for friends liking your page which will look like this. This option only works if your page already has a substantial amount of likes as it will only be seen by those who have friends who have liked your page. If you have thousands of likes, then your ad will be seen by more people vs. if you only have a few hundred. Big brands like Macy’s can capitalize on this ad option as they already have millions of fans. How to Use Sponsored Stories to Boost Visibility for Wall Posts Want to promote a specific status update on your page’s wall? Instead of selecting your page under what you want to promote, choose the option for a specific post instead. You will then get to choose which post you would like to promote in the dropdown below. You can have your ad continue to promote that one post or have it update to promote your latest updates as they become available. This is a great way to promote posts on your wall such as your latest special offer. People will be encouraged to like your page and then visit the promote story itself. Again, you have two options: to create an ad just about the selected post or stories about friends who like the post. If you have a lot of likes on your page, then stories about friends is a good option. Otherwise, you should stick with just the selected post. Targeting Options Once you have decided on your advertising options for Sponsored Stories, you will then get to choose your audience through targeting. Basic options include location, age, gender, precise interests, broad interest categories, connections, and friends of connections. 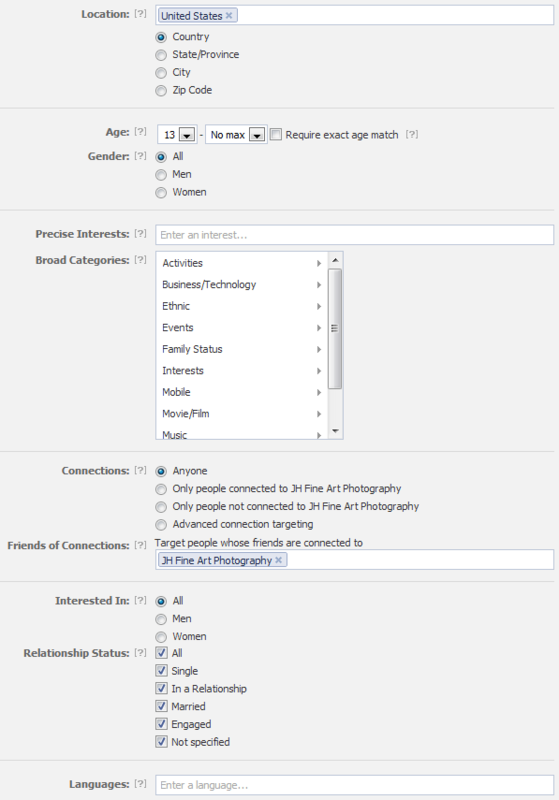 When you click on “See Advanced Targeting Options,” you will see additional options including relationship preferences & status, language, education, and workplaces. Altogether, it is a powerful way to make sure the right audience sees your ad so you are more likely to achieve your ad goals. Not sure how to target your ads? If you have been using Facebook pages for a while, you have likely built up a good bit of demographics data in your Facebook Insights. And with Customer Intelligence, you can get more in-depth data about previous promotions, social button engagement, likes, and much more. Kristi Hines is a freelance writer and social media enthusiast who enjoys spending an ample amount of time exploring the business and personal benefits of using Facebook.